William Rigg was born into a humble Cumbrian family in 1911, the fourth in a family, which would eventually grow to 13 children. After his mother died when he was three his father remarried, and he had to endure his stepmother’s favouritism and bullying. Often sleeping three in a bed and sharing shoes with his siblings because there weren’t enough pairs to go round, young Bill scarcely knew what it was to eat a decent meal. He would scrounge leftovers, steal turnips and potatoes to supplement the family menu and eat hawthorn and nettle leaves from the hedgerows. When the chance came to go to grammar school, he had to turn it down because his parents couldn’t afford to buy him a uniform. Despite all this Bill grew up healthy, happy and fulfilled, impressing employers in a variety of jobs from farm work and road mending to process work at a nuclear power plant, and raising a happy and successful family. He also served with honour in Italy, Austria and North Africa in the Second World. 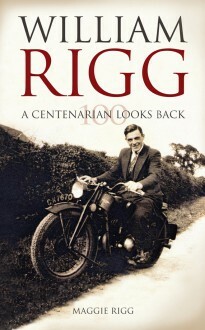 A Centenarian Looks Back has been written by William Rigg’s daughter Maggie to celebrate his hundredth birthday on June 29th this year.